Exocrine pancreatic insufficiency (EPI) refers to the condition wherein the body is unable to produce sufficient amounts of exocrine pancreatic enzymes, thus leading to difficulties in digesting food properly. The condition occurs due to the lack of sufficient enzymes necessary for fat digestion, amylases for starch digestion, and proteases for protein digestion. EPI results due to a number of conditions such as cystic fibrosis, cytomegalovirus infection, pancreatic cancer, chronic pancreatitis, and HIV/AIDS. In the past few years, the vast rise in incidence of causative conditions have driven the global exocrine pancreatic insufficiency (EPI) therapeutics and diagnostics market. According to the report, the global EPI therapeutics and diagnostics market was valued at US$3,397.5 mn in 2016 and is projected to reach US$6,414.4 mn by 2025, expanding at a CAGR of 7.2% from 2017 to 2025. Based on diagnostics, the EPI therapeutics and diagnostics market has been segmented into blood tests, magnetic resonance imaging (MRI), endoscopic ultra-sonography (EUS), and Computerized tomography (CT) scanning. CT scans are conventionally preferred and the most adopted method used for diagnosing EPI. The segment held the dominant chunk in the global market in 2016. While many healthcare professionals continue to use the modality owing to widespread availability and low cost as compared to other scans, the segment is likely to witness sluggish growth in the near future owing to the introduction of advanced and more accurate techniques. Diagnostic methods such as magnetic resonance imaging (MRI), which have been known to be more sensitive when compared to CT scans, are witnessing increasingly high demand across the globe. The segment of MRI is thus emerging as the technique of choice for the analysis of chronic pancreatitis along with CT scans. Hence, the MRI segment is likely to outpace other segments in terms of CAGR during the forecast period. Geographically, the report examines the EPI therapeutics and diagnostics market across regions such as Asia Pacific, North America, Europe, Latin America, and Middle East and Africa. Of these, the market in North America held for the dominant share of the global market in 2016. The regional market is most likely to remain the dominant regional market over the forecast period as well, thanks to the increased cost per prescription for PERT products in the U.S. Factors such as the massive rise in incidence of exocrine pancreatic insufficiency and other causative conditions such as diabetes and cystic fibrosis in the U.S. is expected to remain a key factor contributing to the strong position of the North America market. The report estimates that the EPI therapeutics and diagnostics market in Asia Pacific will outpace other regional markets over the forecast period owing to the increasing population of geriatrics in countries such as China, Japan, and Singapore. Moreover, rising incidence of chronic pancreatitis in India, Malaysia, and China is likely to support market growth. The EPI therapeutics and diagnostics market in Latin America is also projected to exhibit a vast rise in growth opportunities during the forecast period. Factors such as rising incidence of causative diseases, increased focus of governments on improving the healthcare infrastructure of emerging economies, and rising investments by market players are the key factors expected to fuel the market in the region. Some of the leading companies operating in the global EPI therapeutics and diagnostics market are AbbVie, Inc., Allergan plc, Anthera Pharmaceuticals, Inc., Digestive Care, Inc., Janssen Pharmaceuticals, Inc., Nordmark Arzneimittel GmbH & Co. KG, Cilian AG, and AzurRx Biopharma, Inc. 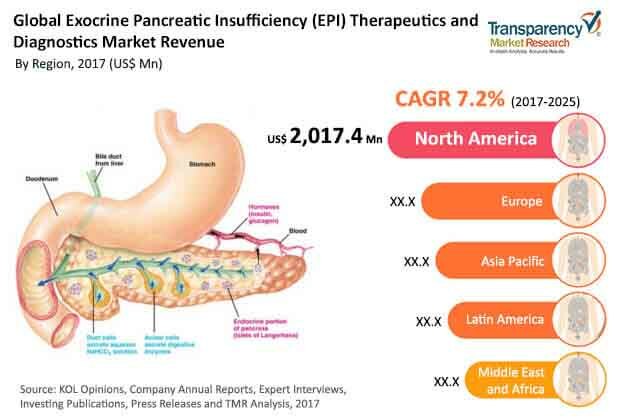 The report on the exocrine pancreatic insufficiency (EPI) therapeutics & diagnostics market analyzes the current and future scenario of the global market. Rise in the prevalence of cystic fibrosis and chronic pancreatitis, and increase in prevalence of diabetes across the world are the major drivers of the global exocrine pancreatic insufficiency (EPI) therapeutics & diagnostics market. The exocrine pancreatic insufficiency (EPI) therapeutics & diagnostics market report comprises an elaborate executive summary, which includes a market snapshot that provides information about various segments of the market. It also provides information and data analysis of the global exocrine pancreatic insufficiency (EPI) therapeutics & diagnostics market with respect to the segments based on therapeutics & diagnostics types, and geography. A detailed qualitative analysis of drivers and restraints of the market and its opportunities have been provided in the market overview section. This section of the report also provides market attractiveness analysis, by geography and market share analysis by key players, thus presenting a thorough analysis of the overall competitive scenario in the global exocrine pancreatic insufficiency (EPI) therapeutics & diagnostics market. Based on type, the exocrine pancreatic insufficiency (EPI) therapeutics & diagnostics market is segmented as therapeutics & diagnostics. The diagnostics segment is again sub-segmented into blood tests, endoscopic ultra-sonography, magnetic resonance imaging [MRI], and CT scanning. The market size and forecast, in terms of value, for each of these segments have been provided for the period from 2015 to 2025, along with their respective CAGRs for the forecast period from 2017 to 2025, considering 2016 as the base year. Geographically, the global exocrine pancreatic insufficiency (EPI) therapeutics & diagnostics market has been categorized into five major regions and the key countries in the respective regions: North America (the U.S., Canada), Europe (the U.K., Germany, France, Spain, Italy, and Rest of Europe), Asia Pacific (Japan, India, China, Australia and Rest of Asia Pacific), Latin America (Brazil, Mexico, and Rest of Latin America) and Middle East & Africa (South Africa, GCC countries, and Rest of Middle East & Africa). The market size and forecast for each of these regions and the mentioned countries have been provided for the period from 2015 to 2025, along with their respective CAGRs for the forecast period from 2017 to 2025, considering 2016 as the base year. The country wise market size and analysis for each segment in terms of value has been provided in the report. The research study also covers the competitive scenario in these regions. The report also profiles major players in the global exocrine pancreatic insufficiency (EPI) therapeutics & diagnostics market based on various attributes such as company overview, financial overview, product portfolio, business strategies, and recent developments. Major players profiled in this report include – Abbvie, Inc., Allergan plc, Nordmark Arzneimittel GmbH & Co. KG, Digestive Care, Inc., Janssen Pharmaceuticals, Inc., Cilian AG, Anthera Pharmaceuticals, Inc., AzurRx Biopharma, Inc. and others.